I hope I'm not offending anybody by observing that early Christianity was a deeply weird religion. Faced with the challenges of appealing to the pagan populaces of Europe, ducking the oppression of the fading Roman Empire, and facing up to Islam sweeping across the Mediterranean, the early church was cultish, warlike, and soaked in blood both literal and metaphorical--a long way from coffee and cookies in the Fellowship Hall at St. Andrew's Episcopal Church in Charlotte, NC. Which partially explains how I came to be in a candlelit underground cavern in a tiny town p erched on a rock in middle-of-nowhere Burgundy, peering into a glass case at a reliquary shaped almost exactly like Indiana Jones' Ark of the Covenant, at a chunk of Mary Magdalene. It looked for all the world as if the night janitor at the basilica had finished up his 3-piece KFC box, and, wiping biscuit crumbs from his moustache, slipped a chicken leg bone between the golden seraphim and into the reliquary. Pilgrimage was big business in Western Europe in the Dark Ages, providing one of the very few motivations for interregional commerce and s purring a sort of tourism industry to places that overwhelmingly only had subsistence agriculture. There were even primitive guidebooks, forerunners to Lonely Planet or Frommer's, that told which auberges had mostly-clean straw to sleep on, which farms sold cheeses that might last until the Pyrennes, and so forth. Towns and churches on the pilgrimage routes prospered, while other towns looked on in envy. 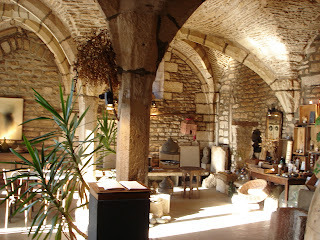 This was the case for the shrine of St. Maximin in Provence. This place had benefited from an, ahem, fortunate chain of events when Mary M agdalene crossed the Mediterranean in an open boat without mast or rudder (uh-huh) to land in Southern France. 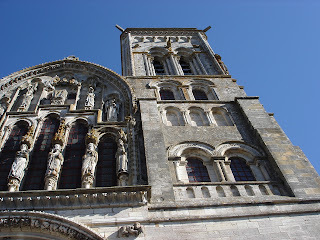 After her death, her mortal remains were transported by the angels (uh-huh) to Aix-en-Provence, where after their discovery (uh-huh) a shrine was built, which made the town and not coincidentally the church quite prosperous. Fast forward to the eighth century, when the Saracens were wreaking havoc across Southern Europe. 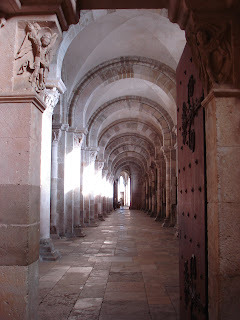 The monks of Vezelay, fearing for the safety (uh-huh) of the relics of Mary Magdalene in Aix, sent envoys to relocate the bits and pieces northward. 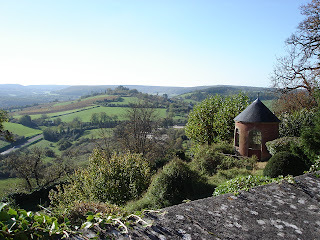 Arriving too late and finding the shrine sacked, they were guided by a divine vision (uh-huh) to an unmarked crypt, where they found the relics, which they reverently transported to their hilltop monastery in Burgundy. 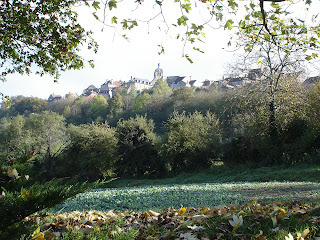 For Vezelay, good times commenced to roll: The abbey church became the stop on the pilgrim trail, and the town swelled with thousands of penitents and the service industry that grew up around them. The abbey church grew in grandeur and importance: It was here, on a temporary grandstand built on the hillside, that S t. Bernard preached the Second Crusade in 1146, and where Richard I of England and Philip II of France met up to launch the Third Crusade (since, you know, the second one went so well). By 1279, however, back in Provence, the monks of St. Maximin announced--oh, snap!--Look, here's Mary Magdalene; she's been here the whole time! We were just hiding her because, you know, Saracens and whatnot. And the relics are performing miracles and healing people, so all y'all pilgrims should come check it out! 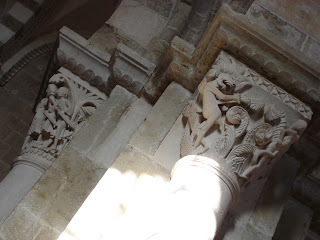 The crowds dwindled and things grew quiet in Vezelay as the centuries went on, except for the occasional sacking during the wars or religion and some halfhearted facade-defacing during the revolution. The population shriveled from about 50,000 (Incredible! Where did they all live?) 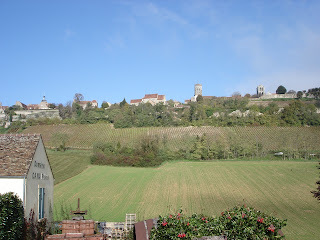 at the height of the church's influence to about 500 farmers, woodcutters and winegrowers in stone houses clinging to a sharp-sided ridge. Economic ruin is often the best possible thing for preservation, though. Good for us, anyway. 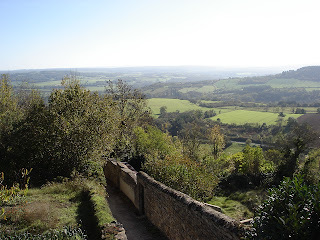 You can stand on a crumbling rampart in Vezelay on a clear, cold November morning, having awoken in a 10th-century stone hostel and eaten toasted bread and cheese before an open fire in a vaulted cloister, and look out on a spectacular view of the valley that provides no evidence that you are in the 21st century and not the 13th. This post turned out to be so long that I'm going to break it up into pieces. That's just good marketing, see--always leave 'em wanting more. More on our visit in Part Deux.